As a student I often open my email inbox in the morning to see a barrage of circulars aimed generally at postgraduate students, PhD students and researchers. Often the former are less relevant than the latter and sometimes within them are invitations to take part in research studies. Recently however I have noticed a developing trend of branching the apparent gap between science and art. However for me there has never been much of a gap in my eyes, I’ve always thought that scientific images and drawings could be beautiful. It has been a geeky aspiration of mine to have my own karyotype printed on a canvas and hung somewhere in my house. So the idea that there are art competitions out there dedicated solely to ‘research images’ is brilliant in my eyes. It’s another way of showing the world what we do in an aesthetically appealing manner. In addition to these university led competitions and galleries (see UCL’s Research Images as Art / Art Images as Research page) I have now been shown a piece performance art and animation that has pushed my ideas of how our scientific methods, research and theories can be presented. I have seen creative animations describing research topics and theories before (check out this video explaining a PhD thesis in 2 minutes run through phdcomics.com/tv/) however today I was shown a trailer for ‘Theory of Flight’ by Anna Lindemann. She is a biology graduate from Yale who has crossed over from a possible career in research to take a master’s degree in electronic arts. Describing herself as being in the ‘hazy territory’ as ‘a “science” person around “art” people, and an “art” person around “science” people’ it seems like she has found just the right balance between the two disciplines. As she not conducting research herself, she looks to describing (incredibly up-to-date) theories of “evo-devo” – evolutionary developmental biology – and biological processes. One thing that stuck out to me was how Anna describes her process as a lot of trial and error. This is very similar to the way researchers get to their answers. You have a general idea of what could work but there’s a lot of tweaking of protocols, branching of ideas and, if it all goes pear shaped, scrap it and start again! Theory of Flight has been shown at many science/art crossover events such as the Experimental Media and Performing Arts Centre, the Entertaining Science series, at “Survival of the Beautiful Wonder Cabinet“, as well as working with high school students through the ArtScience Prize. Just that list shows how Anna has been continuously closing that gap along with many other members of the scientific community. Livet, Jean. 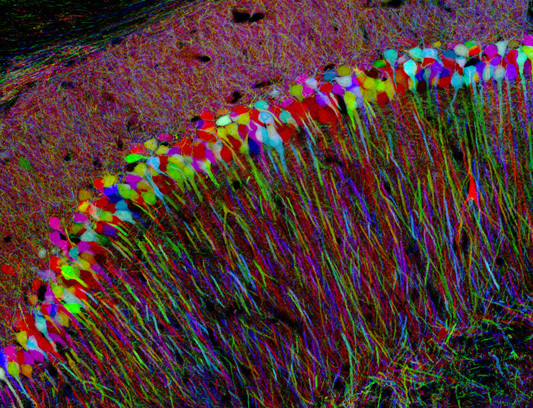 “The brain in color: transgenic” Brainbow” mice for visualizing neuronal circuits].” Médecine sciences: M/S 23.12 (2007): 1173. Lichtman, Jeff W., Jean Livet, and Joshua R. Sanes. “A technicolour approach to the connectome.” Nature Reviews Neuroscience 9.6 (2008): 417-422.